In a recent de-lidding video released by world renowned overclocker der8auer, it was revealed that Intel is now skimping on the thermal interface material even on their high end X-Series processors. In the video, we can see that Intel is using their cheap TIM (Thermal Interface Material) which conducts heat poorly when compared to solder which has been used in previous generation HEDT processors. By using TIM rather than solder, Intel stands to save a couple cents per processor however, this significantly increases processor temperatures which reduces maximum overclockability. 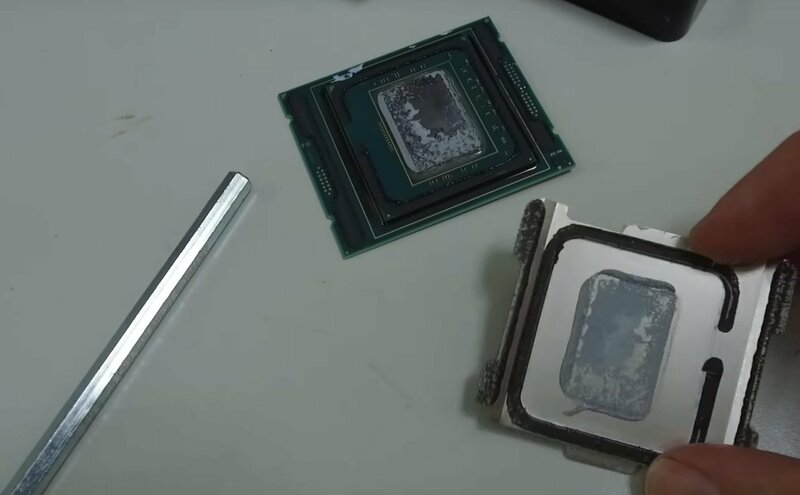 As a result, serious overclockers will likely need to de-lid their processors to achieve the best overclocks, running the risk of damaging their CPUs in the process. What do you think about Intel’s decision to skimp out on solder on their new X-Series CPUs despite the fact that AMD’s significantly cheaper CPUs don’t even skimp out on solder? Let us know in the comments below! Very poor decision by Intel. This, along with Intel making the 8/16 Core i9 7820X only support 28 PCIe lanes, instead of 44, really makes them look bad. I’m guessing the 7820X thing was to motivate people to spend more money on the higher end cpus, but not to use solder is just stupid! Do they even know who they are trying to sell these very expensive cpus too???! Look at the crappylake 7700k (I still recommend the 6700k over the 7700k), Intel has now officially made the recommendation for 7700k owners to NOT overclock them. How dumb, people who buy k series cpus do so to overclock! What is going on over at Intel?! Still, having said that, people will buy these, including myself. Yes, I go with Basin Falls by force. As for Intel, I wanted to buy the 7820X, but now will go with the 7920X instead. Why, so to future proof myself a bit and get all 44 PCIe lanes. I only want a clock speed of 4 GHz anyway so this shouldn’t affect me much, hopefully. Honestly, this BS from Intel would have made me go with AMD’s Whitehaven, BUT because the AIBs are continuing to make the Intel boards better than the AMD ones, I’m being forced to go Basin Falls. The motherboard is the most important part of the build for me and it will dictate which platform I go with. So, because of how much better the X299 boards are as compared to the X399, I will go with the Basin Falls platform and the GIGABYTE AORUS Gaming 9! Still, I hope most choose Whitehaven over Basin Falls and AMD becomes #1 in the HEDT market.